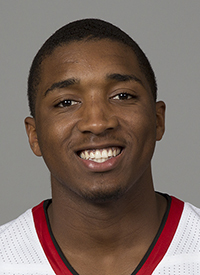 Strengths: Donovan Mitchell has off-the-charts, jump-out-of-the-gym athleticism. The sophomore shooting guard is explosive with a quick first step that helps him blow past defenders and get to the rim with ease. He has the ability to create space offensively with his speed, so defenders don’t know where he is going to go when he has the ball in his hands. That athleticism also helps him on defense, where he can take the challenge of guarding the other team’s best wing player every night. For a guy that is undersized, he makes up for it with his athleticism and strength. Weaknesses: At 6’3 Mitchell is a bit undersized for a shooting guard. He does not quite have the ball handling ability to be a point guard, so he has to use his athleticism to make up for his height deficiencies. His jump shot could also use some work. He has the potential to be a typical 3-and-D player, who can also finish at the rim in the NBA, but he needs to work on his jump shot. His shot is not ugly, it just has not fallen in his time at Louisville so if he continues to work on that he can be a very solid NBA player.